Heard of Bumble and Bumble? Haha only joking, of course you have! The brand hit the UK market hard last year, and everyone was raving about the 'Surf Spray' and 'Dryspun Finishing spray' as well as many more of their products including their shampoo's and conditioner's. Before I start the review I just want to say a bit about my hair. When I first started using this I had hair extensions and have since had them removed. My hair texture is fine, and I have a good amount of it, not loads, but enough. Because my hair is fine it can be very weak and using bleach, tints and styling products has damaged it (I'm sure most people's hair is in this condition), so I thought this conditioner was the best one suited for my hair. I like to think that when I buy a product I do a bit of research before hand, not wanting to waste my money and be left with a product I wouldn't use. Unfortunately I didn't research this, it was bought on a whim, I was whipped up in the bumble and bumble storm and swept away with all the hype. 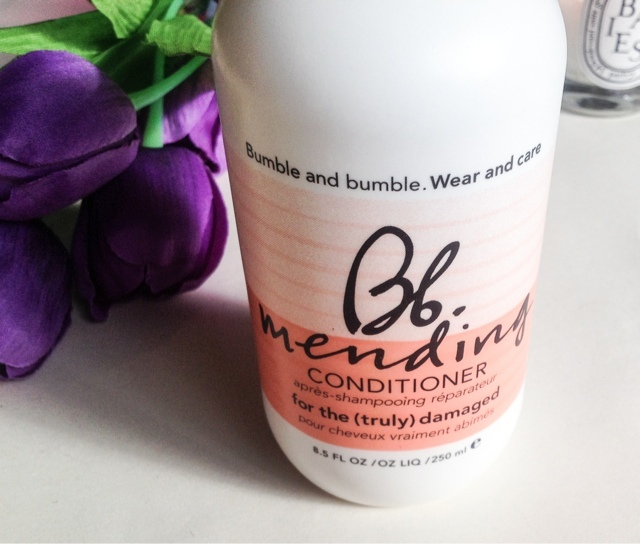 The Bumble and Bumble Mending Conditioner is aimed at truly damaged hair, designed to repair chemically treated, damaged hair to strengthen and protect as well as delivering shine. As a hairdresser I am used to trying lots of different brands, all promising the same thing, and I can usually judge a product after the first couple of uses, going by the texture of the conditioner, how it sits on the hair and the initial result it delivers. I was disappointed with the results from the outset but persevered wanting to give it a fair test. The consistency of the conditioner is a lot thinner than I thought it would be. Normally conditioners designed for "truly damaged hair" are quite thick and concentrated, so I was surprised that this wasn't, it's not runny but more of a thick styling milk. When using this ( as with all conditioners I use) I always leave it on for a few minutes, I never wash and go as I want the product to penetrate my cuticles and this can't be done in a couple of seconds, can it? Usually when you rinse a conditioner off your hair is left feeling smooth and silky... no? My hair felt a little softer but nothing warranting the £25.00 price tag! To be honest when I first tried it I wasn't sure if the conditioner wasn't working as well due to my hair extensions, maybe the formula didn't suit or wasn't strong enough for the hair I had used. I've since had them removed and tried the conditioner again, confident I could give it a better chance now that my hair was in its natural state. But alas still no joy. In my opinion it conditions the hair no better than a run of the mill super market brand, in fact I'm currently using some products from Charles Worthington and I think they work just as well if not better and are a fraction of the price! Without this being a truly negative review I have found something I do like about the conditioner,... the smell, it smells kinda nice! So if you're wanting to send £25.00 on a conditioner that smells 'kinda nice' then this is it, otherwise save your money and give this one a miss!